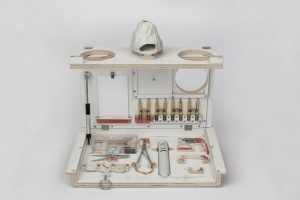 Tomio Koyama Gallery is pleased to present Smutshow, a solo exhibition of works by Tom Sachs. 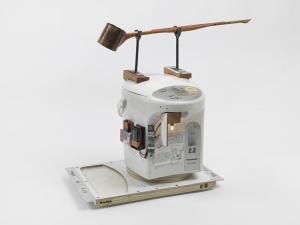 This show is organized in correspondence to the exhibition, Tom Sachs: Tea Ceremony, held at Tokyo Opera City Art Gallery (Hatsudai, Shinjuku) from April 20 to June 23, 2019. 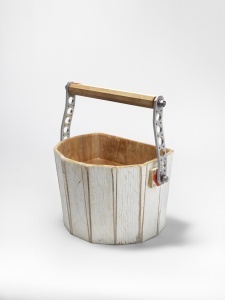 Along with the related exhibitions Tom Sachs: Indoctrination Center at KOMAGOME 1-14 cas (Komagome, April 20 – May 14, 2019) and Tom Sachs: Pop-up Store at Beams Harajuku (Harajuku, April 19 – May 6, 2019), this constitutes part of a large-scale presentation of Sachs’ works in four locations across Tokyo. TOM SACHS (b. 1966, New York) is a New York-based sculptor known for his work inspired by icons of modernism and design. Using modest studio materials, Sachs creates parallel universes incorporating semi-functional sculpture, sometimes deployed by the artist and his studio assistants for interactive projects, as in Nutsy’s (2001-3) and Space Program (2007, 2012, 2016-17). His work is in the collections of the Museum of Modern Art, New York; the Metropolitan Museum of Art, New York; the Solomon R. Guggenheim Museum, New York; the Whitney Museum of American Art, New York; the J. Paul Getty Museum, Los Angeles; and the Centre Georges Pompidou, Paris, San Francisco Museum of Modern Art, San Francisco; and the Astrup Fearnley Museet for Moderne Kunst, Oslo among others. He has had solo exhibitions at the Nasher Sculpture Center, Dallas (2017-18), Yerba Buena Center for the Arts, San Francisco (2016-17), Noguchi Museum, New York (2016), the Brooklyn Museum, New York (2016), the Contemporary Austin, Texas (2015), the Park Avenue Armory, New York (2012), Aldrich Contemporary Art Museum, Ridgefield, CT (2009), Gagosian Gallery, Los Angeles (2007), Lever House, New York (2008),Fondazione Prada, Milan (2006), and the Deutsche Guggenheim, Berlin (2003), the Bohen Foundation, New York (2002), SITE Santa Fe (1999)among others. His film A Space Program was released by Zeitgeist in 2016, offering viewers a glimpse into the artist’s studio practice, philosophy, and the narrative surrounding his 2012 project with Creative Time at the Park Avenue Armory. (For more information on the artist, please see the following URL. 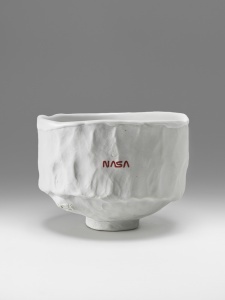 Tom Sachs: Tea Ceremony was conceived for and organized by The Noguchi Museum in New York in 2016in commemoration of its 30th anniversary. （https://www.youtube.com/watch?v=tJZB4A0wVRM） Following the way of Tea—in order, as Isamu Noguchi put it, to pursue the “true development of an old tradition”—Sachs has conceived his unique perspective of the world, appropriating industrial materials and familiar everyday objects to create various tea utensils from bowls and kettle, ladles, scroll paintings, and vases, to a motorized tea whisk, a shot clock, and an electronic brazier. With a handmade plywood tea house, an arrangement of rocks reminiscent of a sublime peak, and a koi pond complete with live swimming carp, Sachs’ universe of tea manifest within the space of the museum had come to coexist with the sculptures of Isamu Noguchi to give rise to a remarkably epochal exhibition. Selected works from this exhibition were also presented in Tom Sachs “Heaven” held in 2016 in Isamu Noguchi’s indoor stone garden “Tengoku (Heaven)” at The Sougetsu Kaikan (Tokyo, Japan). 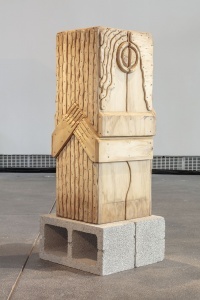 The exhibition has since received further acclaim, traveling to Yerba Buena Center for the Arts in San Francisco, CA (2016-17) （https://www.youtube.com/watch?v=zX9vWuf_0A4）, and the Nasher Sculpture Center in Dallas, TX (2017-18) （https://www.youtube.com/watch?v=CplZ1OXX5cs）. Sachs and his studio have engaged in extensive research and an on-going exploration of chanoyu, traditional Japanese tea ceremony—including examples of the wide range of elements that comprise its intensely ritualistic universe. From the moment Sachs began developing a culture of Tea, he aimed to exhibit his Tea Ceremony in Japan. At Tokyo Opera City Art Gallery, this completely immersive and interactive environment will at last be seen in the country that inspired it. Marking Sachs’ first solo presentation at an art museum in Japan, the exhibition in Tokyo will feature a series of new works that reflect Sachs’ further reworking of chanoyu, as well as a layout that is uniquely catered to its particular venue. 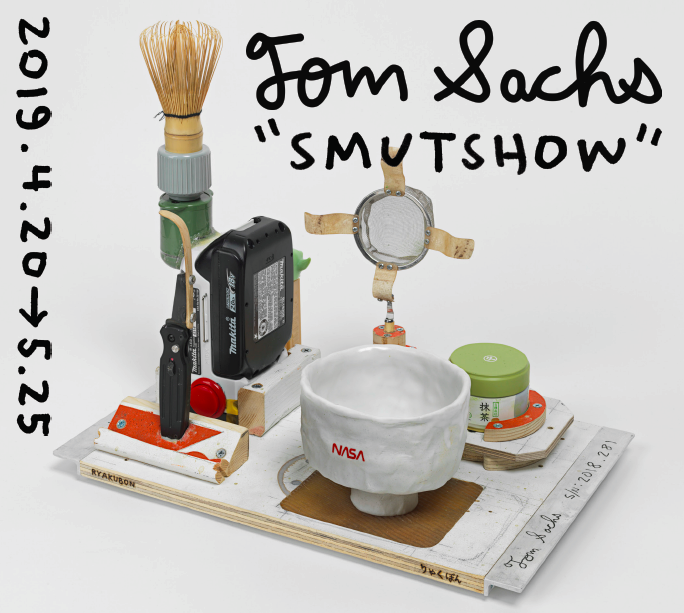 Tom Sachs’ Smutshow at Tomio Koyama Gallery is an exhibition that links with and serves to mutually complement the “Historical Garden” featured in Tom Sachs: Tea Ceremony at Tokyo Opera City Art Gallery. 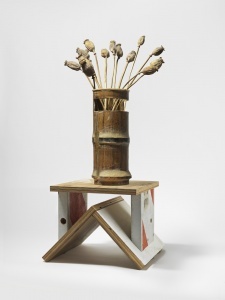 Presented on this occasion are a series of tea utensils and related objects that embody “Tom Sachs’ world of chanoyu,” including “Kodo” (2017) in which he uniquely interprets and sublimates the traditional Japanese culture of kodo (the art of appreciating incense) into his own work; “Fredo” (2018), a handmade ‘perfectly imperfect chawan’ featuring the NASA logo; and “Cha-ire” (2018) that incorporates a battery by Japanese electronic power tools manufacturer, Makita Corporation. With the shelving and display units also designed by Sachs himself, the exhibition consists of 28 works that are either new or have never before been presented in Japan. Tom Sachs: Tea Ceremony reinterprets the spirit and values of chanoyu as an essential spiritual activity in the context of 21st century space travel, and through its unique ideas and perspectives serves as a valuable opportunity to explore the significance of traditional Japanese culture in the age of globalization, as well as new possibilities for its development. Furthermore, Smutshow at Tomio Koyama Gallery, and the respective exhibitions held throughout various venues in Tokyo reflect Sachs’ diverse interests and scope of curiosity that are not limited to a specific genre. Sachs’ extensive practice that while centering on art transcends the boundaries of genre to traverse fashion, design, sports, and even nations and their respective borders, present us in the face of our current times, with new perspectives and ideas on how to live within this world.